Five sticks of explosives have been found and made safe in a top Paris department store, French police say. The Printemps Haussmann store was evacuated and cordoned off, and police directed traffic away from the area. French news agency AFP received a letter signed by a group calling itself the Afghan Revolutionary Front, warning of "several bombs" placed in the store. President Nicolas Sarkozy urged caution in reacting to the incident. There was no detonator linked to the explosives. "All we can do is to be prudent and moderate," Mr Sarkozy said at a news conference in the European Parliament. "My belief has not changed since 2002 that vigilance in the face of terrorism is the only possible line to take." 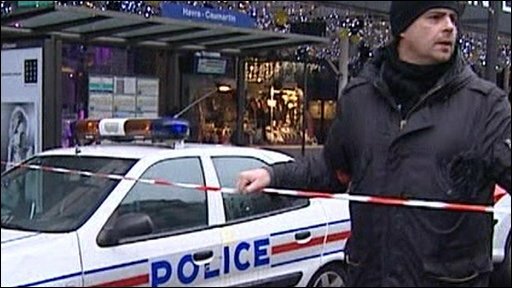 The BBC's Hugh Schofield in Paris says the incident is a scary warning to the French people and a reminder that they are not immune to the scourge of terrorism, despite there being no significant attack on French soil for more than 10 years. Officials said the explosives, planted in washrooms on several floors, were first located by sniffer dogs. They consisted of old sticks of dynamite held together with a piece of cord, according to an officials quoted by news agency AFP. "Based on what we know, it was not a device that was set to explode. We are going to carry out an investigation to find the perpetrators," AFP quoted Interior Minister Michele Alliot-Marie as saying at the scene. The store, on the city's central Boulevard Haussmann, was evacuated as the area was busy with shoppers ahead of Christmas. One shopper told AFP the evacuation was calm and orderly. The Afghan Revolutionary Front is a previously unknown group. "If you do not send someone to intervene before Wednesday December 17, they will explode," said its letter, which was taken by police investigating the explosives. "Send the message to your president that he must withdraw his troops from our country before the end of February 2009 or else we will take action in your capitalist department stores and this time, without warning." France has about 2,600 troops serving with Nato in Afghanistan, after reinforcements were sent earlier this year. In a video broadcast last November, a Taleban military leader, Faruq Akhun Zadeh, warned that "our reaction will be heard in Paris" if the troops were not withdrawn.